Drove to Salinas to share a cousin’s big day. Artichoke fields blurring by, but there’s no mistaking those spiky leaves from the car. The slough at Moss Landing, with a snowy egret back there. 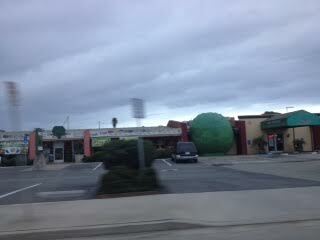 You know you’re driving through Castroville when the front of the strip mall includes a giant artichoke (which would have been clearer if the driver had just held still, y’know, right there where the highway kind of peters out for awhile there going through town.) If you’ve eaten a ‘choke you’ve tasted a part of their town. I knit half a cowl on the drive down. I put away the knitting and simply absorbed the landscape as we took the coastal route back up.